Posted by EftelingUK in Food! Maybe you are wandering around Efteling and find yourself feeling peckish, but not hungry enough to go and buy a whole meal. That is where these little wonders come in! 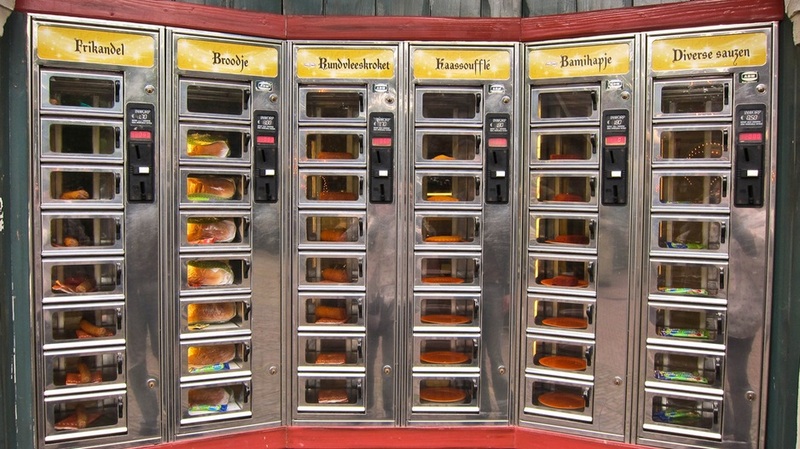 Automatiek machines dispense food, in small quantities. Items such as corn dogs, curried sausages and mince sticks are all included in the machines, as well as a couple of vegetarian options. There are even bread buns available to accompany your snack! Each snack is priced around the 1.70€-1.90€ mark, and there are also sauces available for 50¢. The idea is simple: you put your money in the slot and then choose which snack you want by simply opening the little door and taking it. It isn’t something we experience much of in the U.K, but it is a great idea, especially if you don’t want to stand in line for food on a busy day! It wasn’t until my most recent trip that I tried using these machines, and now I wonder why I never did! The food from them was really nice. The only slight drawback for anyone who does not speak Dutch, is that you probably won’t have a clue what you’re getting. The only thing I was sure about was that broodje was bread. On the up side, I used the machines twice, and both times I ended up with something really tasty; it was quite a nice surprise! There are a few sets of these machines throughout the park, usually at counter service eateries. For a closer look at what you can find in the machines, click here! Many thanks again to Milena Kirk @ http://aegtte.weebly.com/ for the use of her wonderful photos!